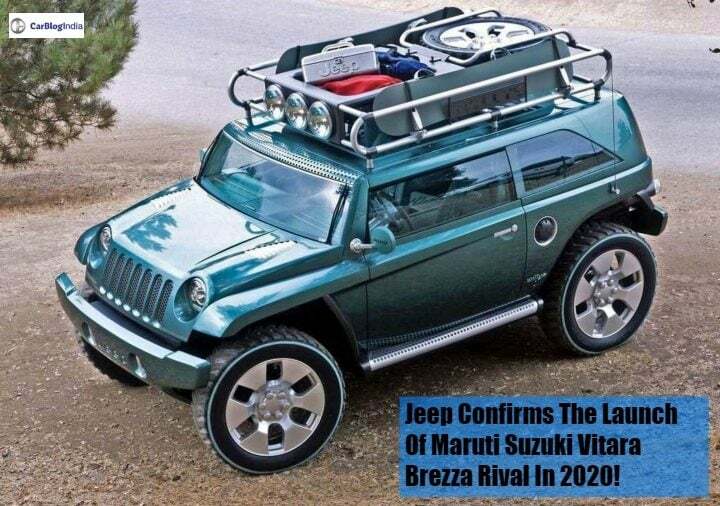 Jeep confirms the launch of Maruti Suzuki Vitara Brezza rival in 2020! Jeep has confirmed that it is going to launch a sub-4-meter compact SUV in India during 2020 which will take on the likes of Vitara Brezza, Ford EcoSport and Tata Nexon. Jeep is currently tasting a small slice of the pie which is the boom for compact urban utility vehicles in India with the sales of its locally manufactured Compass. The American automaker, however, is planning to take an even bigger portion with the help of two new models, aimed at penetrating even deeper into the fiscal food chain. In addition to the 2018 Renegade, Jeep has now confirmed that it is also going to launch a sub-4-meter compact SUV to challenge the likes of Maruti Vitara Brezza, Ford EcoSport and the Tata Nexon. Kevin Flynn, the Managing Director for Fiat Chrysler Automobiles India, in an interview with Business Standard, has said that the American automaker will launch a sub-compact SUV in India during 2020. Jeep had already confirmed that it is going to develop an under 4-meter SUV fro the Indian market in its Five Year Plan recently. The new development puts a specific time period for the launch of the same. So far, apart from information that Jeep will launch this vehicle in India, no other concrete details regarding this product are with us. That said, we can safely say that the automaker will manufacture this new SUV in the same Ranjangaon plant in Maharastra. This local manufacturing will help Jeep in keeping the prices low and hence competitive. Being a product from the stables of Jeep, we can expect the new compact SUV to have the automaker’s classic design. This will include a dominating, classic box design with certain angular edges like the Renegade to add a bit of flair. The cabin of this SUV will be functional yet loaded with features quite decently. In addition to this, it is bound to come with all the basic safety kit as standard. It would be too early to comment on the engine specifications of this new SUV. What we can safely say is that Jeep is likely to provide both petrol as well as diesel derivatives. In addition to this, this new sub-4-meter compact SUV will have both manuals as well as automatic transmission options available. Since this new vehicle will compete in the class of Vitara Brezza, EcoSport and Nexon, and thanks to the local manufacturing, it will have a very aggressive price tag. Expect the base variant of this vehicle to cost starting from INR 7.5 Lakh. While the top of the line trim can go up to INR 10.5 Lakhs.